MUSCAT: It’s no secret that real estate developers and building owners have been finding it increasingly difficult to meet the parking space requirements of people. But that might become a thing of the past, as automated parking system is all set to make its debut in the Sultanate. 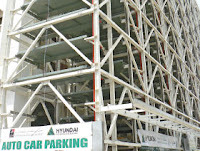 Taking a major stride forward in this direction, North Ocean Enterprises (NOE) has successfully completed the mechanical installation of Hyundai Autocarparking Systems for City Seasons Hotel, Al Khuwair, which will be the first of it kind in the GCC region. The system is expected to offer solution to the increasing parking woes of Muscat, which has been witnessing a steady rise in the number of vehicles and population. The system is totally automated. Thasleem Khan, project director, who demonstrated the car parking system to the media, explained, “The car is parked in the front of the elevator. The driver goes to control panel and registers his password and presses the button. The door of the elevator opens and the driver takes the car inside and parks it in the pallet which is on the lift. “The driver comes out and the sensor, which is near the entrance of the elevator doors, immediately informs to control panel that the driver has come outside of the lift. Thasleem later explained the retrieval of the car from stored space. “The driver presses the button in control panel for retrieval of the car and enters the stored password in the control panel. The elevator goes to the destination of the pallet entered in the control panel by the driver. Shabbir Boriyawla, managing director, NOE, said, ‘We are very proud that our team has successfully commissioned a very complex project which is the first of its kind in the Middle East and Oman. Muscat Municipality, several ministries and major corporate houses have also shown interest in the auto parking system.